Surprise! Former heavyweight champion Brock Lesnar (pictured) is not returning to the UFC. UFC president Dana White had been teasing fans since last month of Lesnar’s possible return to real fighting. Fans weren’t the only ones who were intrigued, as Alistair Overeem, the last man to face Lesnar inside the Octagon, requested a tango with the WWE superstar after collecting a much-needed win over Frank Mir on Saturday at UFC 169. 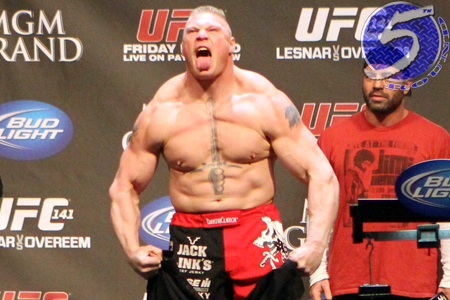 “Brock Lesnar is not coming back,” White stated at the UFC 169 post-fight press conference. “Brock Lesnar is not fighting. I mean, does he want to come back? I mean, We’ve talked about him wanting to come back. He feels like he wasn’t 100 percent while he was here. He feels like he sold himself a little short and all the stuff I’ve told you before. Lesnar, who is now 36, hung up his MMA gloves after getting TKO’d by Overeem over two years ago at UFC 141. He left the game with a 5-3 professional record, with all but one of his scraps coming inside the big leagues.